This science experiment is adapted from the Salters Horners Advanced Physics Project. It corresponds to Activity 17 from the ‘Transport on the Track’ section of the course and provides an opportunity to look at electromagnetic induction and use the data collected, with additional information, to calculate speeds and acceleration. Electromagnetic induction could be used on railway systems to sense the speeds and accelerations of trains. The purpose could be to sense trains being driven too fast for the track section they are on and give feedback to the drivers on this, or perhaps to detect runaway trains and put into action a means of diverting a train to a section where it will avoid collision with other trains until it comes to an eventual stop. One such system might be designed as shown in Figure A17.1 where the train has a small magnet attached in the vertical plane to its front which then passes over two coils set into the track. See the technicians’ notes section for details of apparatus and how to set it up. 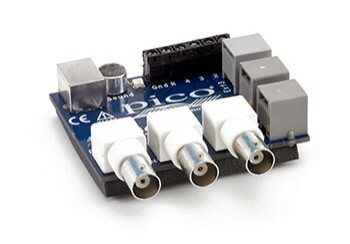 Fit the connecting cable between the Pico ADC-40/42 BNC socket and the Output sockets of the amplifier. Connect leads from the track coils to the Input sockets of the amplifier. Load the PicoScope software. Adjust the X time-base setting to 100 ms/div and a gain of *1. Set the Y gain to *20. Set the trigger to Single, Rising and to 20 mV*. In order to see exactly where the trace starts from, have its trace display setting (far right-hand box on the bar at the foot of the screen) put to -10%. Wind up the clockwork model train. Place it on the track about 5 cm in front of one of the coils. Click the cursor on GO. Release the train. A trace similar to that of Figure A17.2 should be displayed. Switch off the amplifier after use. *You may be able to reduce this but the value must be high enough to prevent triggering too early. Why is a voltage produced across the coils? Why does the trace produced by each coil have both a negative and positive part? State and explain two differences produced by coil A and coil B. If the spread of the field of the magnet produces a noticeable effect over 1.5 cm as it passes over coils of diameter 1.0 cm, as shown in Figure A17.3, calculate the average velocity of the model train as it passes over each of the coils. Think carefully over what distance the magnet will have moved whilst producing an effect at each coil. 5. What is the time taken by the model train to move from the centre of coil A to the centre of coil B? 6. Use your answers to Q4 and Q5 to calculate the acceleration of the model train.